Equity indices barely budged as trade optimism grows. The top headline, among a host of big news, is word from Secretary of State Steve Mnuchin. Mnuchin says progress is being made on key issues between the US and China and that he is going to China next week. The trip is the third in a series of progressively important meetings leading up to the anticipated Trump/Xi face-off now scheduled for later this month. The face-off will not likely bring an end to trade disputes but it will likely lift sentiment and unleash global economic activity; assuming, of course, there is a positive conclusion to said meeting. Mnuchin also went on the record saying the Trump economic agenda was working. His remarks were aimed at what he describes as a worrying socialist trend among lawmakers and come with the ultimatum we're not going back to socialism. The State of the Union Address was much as I had anticipated, a lot of Trump applauding himself ad some jabs at Congress intended to get them working. Trump says it's time for Congress to be great or be gridlocked, to put aside politics and get things done for the American people, but I don't think anyone heard him. The issues that have long plagued America are probably not going to get fixed by this mixed, divided, partisan Congress and that is too bad. Immigration, infrastructure, and trade are America issues, not just planks in Trump's platform. Moving on to business news, earnings season continues to roll on and the results continue to be mixed if generally better than expected. Topping the list of reports released before the bell are GM and Spotify. GM reported revenue beat by $2 billion and EPS of $1.43 by nearly a quarter on strong sales, pricing, mix, and cost-controls. 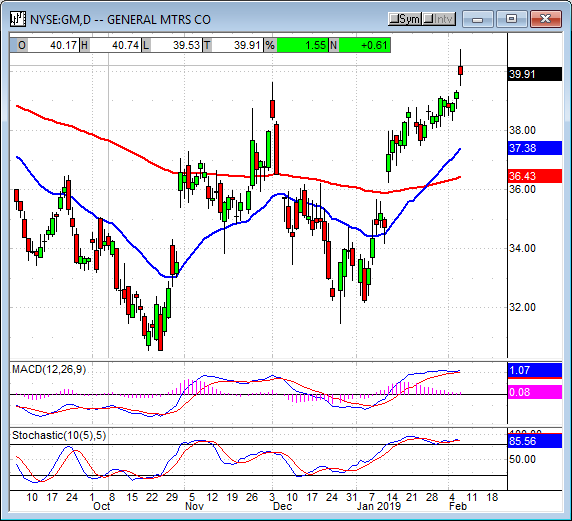 Shares of GM were up as much as 4.0% in the pre-market session but shed some of those gains after the open. Spotify sank -7% in early trading but bargain hunters were there to scoop up the deal. Spotify barely missed on revenue and earnings while acquiring two new podcasts. Fourth quarter monthly active users grew more than expected and are projected to at least meet consensus in the coming year. Other metrics were positive as well, barely missing expectations in most cases, and point to sustained user growth and usage. The move to podcasts seems to be working, Spotify is planning on buying two more podcast producers this quarter. 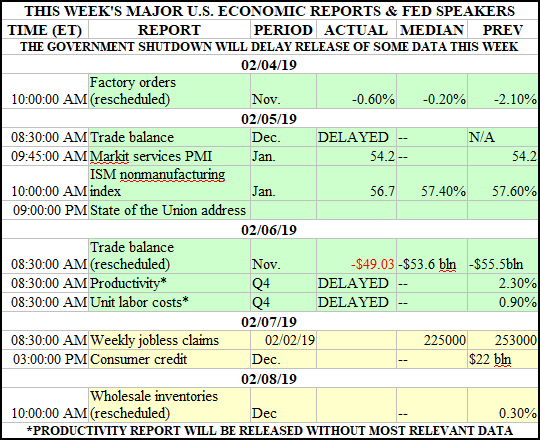 There were quite a few economic reports that could have come out today but most didn't, delayed by the government shutdown. Because the next shutdown could start as early as next week it may be a while before we get caught up on the affected data. The market will be flying blind. Mortgage applications fell -2.5% in the last week. The drop in applications is unexpected because rates have been falling but may be due to the large numbers of applications submitted last month. Regardless, mortgage apps are -10% from this same time last year and point to a much cooler real estate market in 2019. In trade news, economic news, US exports fell slightly in the last month but were outpaced by a much larger decline in imports. The decline in imports was enough to shrink the trade balance for the first time in five months but not enough to offset increases over the last year. On a YOY basis, the trade balance is up more than 10.0%. Because last year's run-up in trade imbalance, and this month's decline, is due in large part to tariffs the trade balance may continue to shrink this year. If the trade-talks result in renewed trade ties and Trump gets what he wants, the trade balance will shrink more and that will drive positive GDP growth for the US. The Dollar Index moved higher as central bank outlook becomes entrenched. Both banks are expected to hold off on policy tightening for the foreseeable future although the FOMC is the only bank to confirm this view. The ECB is holding off in fear of setting a policy path ahead of this years change in leadership that will determine the new leader's actions. Janet Yellen appeared in an interview today and delivered a very dovish statement. The former head of the FOMC and a still-influential person says the next move for the FOMC is a rate cut if global slowdown continues. Other central banks have also indicated a shift in thinking, most notably the Reserve Bank of Australia, which just indicated a possible rate cut later this year. 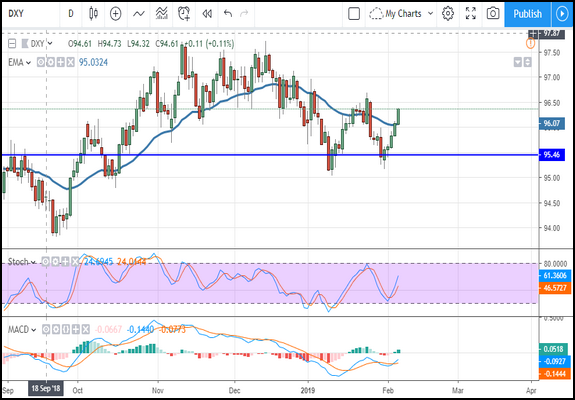 The DXY is likely to move up in the near-term and could reach $96.50 or $97.00 this week. The ECB's Economic Bulletin and Forecasts are due out tomorrow, weak updates and outlook from the EU would help send the dollar higher. Gold prices were able to hold relatively steady for most of today's session despite the stronger dollar. Later in the session, that changed, gold prices began to fall and wound up shedding about -0.60 by the end of the session. 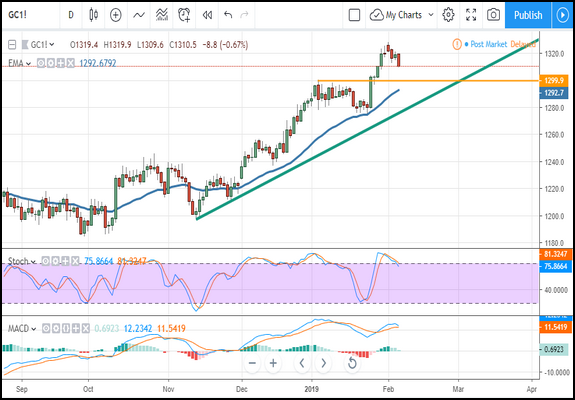 The move confirms resistance at the $1,320 level and may lead spot price down to retest support at the $1,300 level. 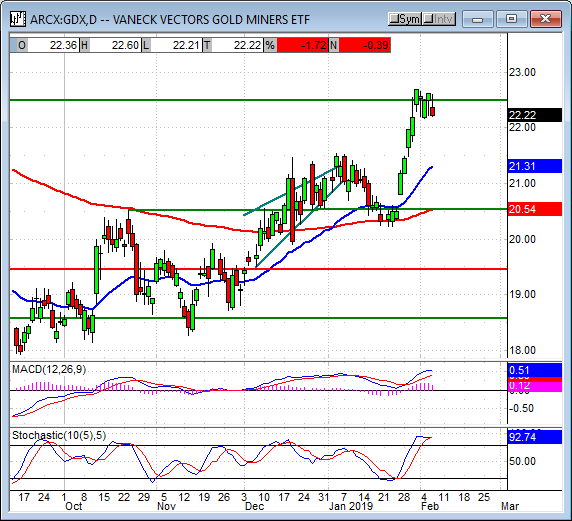 The Gold Miners ETF GDX looks like it is at resistance and may not move higher. The ETF is confirming resistance with today's candle and the indicators confirm the peak so some sideways to down movement is expected. 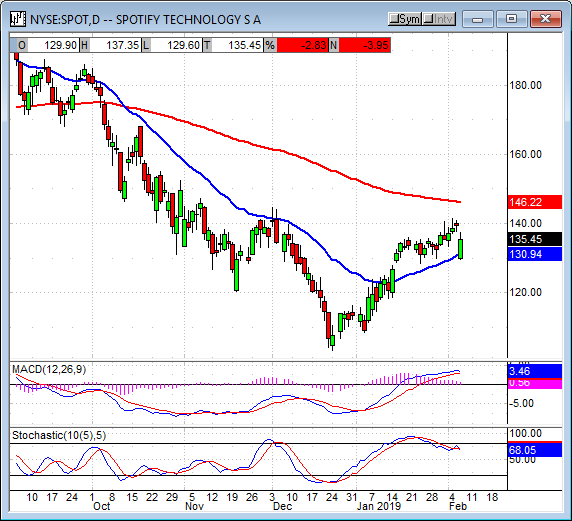 A move lower would be bearish and could take the ETF down to $21.50 or lower. 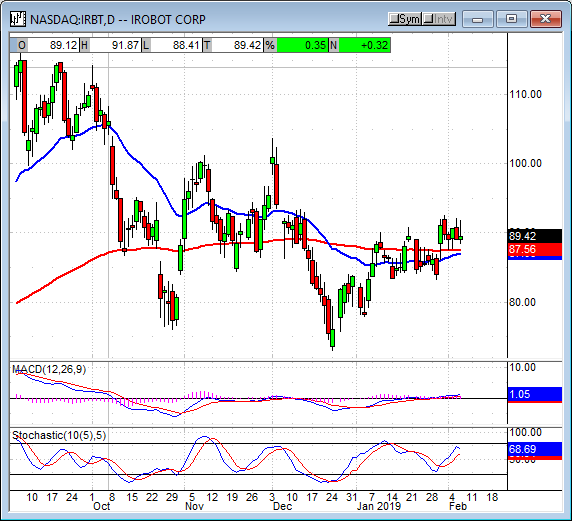 A move sideways could result in a continuation of the recent uptrend but it's too soon to bet on that. Oil prices were a little volatile in today's session as supply concerns begin to build up. Now, along with OPEC, the market is balancing sanction against Venezuela, and signs of tightening in the US. On the OPEC front, data from Platts shows OPEC production has fallen to a near 3-year low. This week's EIA inventory data was weaker than expected in almost all aspects due to tightening efforts; crude and gas supplies rose less than expected and distillates fell more than expected. 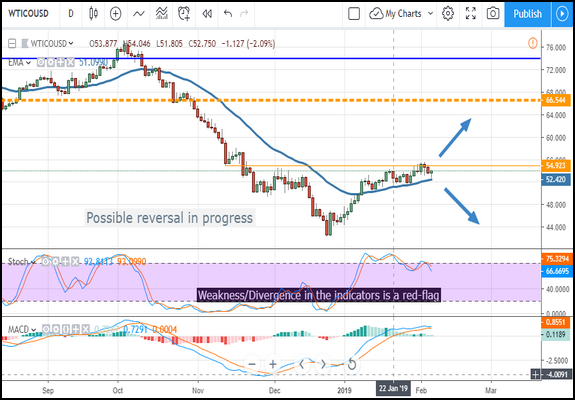 WTI had been moving lower and testing support at $52.50 in early trading but bounced on the news and regained all of today's losses. It looks for now like the market is moving higher, oil may accelerate its move if more signs of tightening emerge. The Oil Index was relatively steady in today's session, it posted a loss of -0.50% but created a very small spinning top doji in the process. 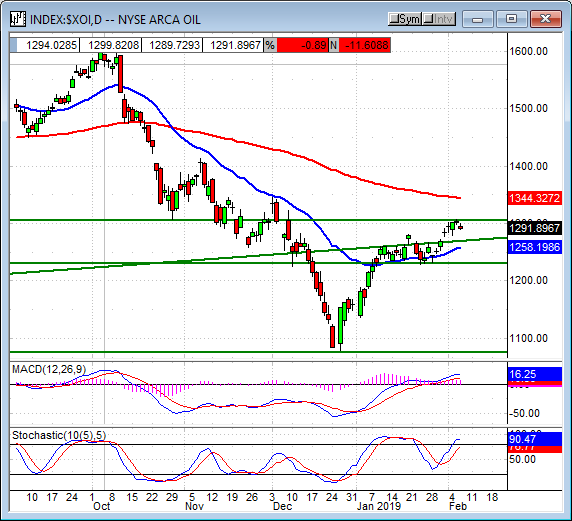 The index is still consolidating beneath the 1,300 resistance and waiting on cues from oil. The indicators are bullish and suggest a move higher is possible, the indicators are also diverging from the recent high which suggest resistance at 1,300 may hold. Even if resistance at 1,300 is broken the long-term moving average would need to be broken before getting bullish on this sector. Electronic Arts reported weaker than expected revenue and earnings this morning and had the entire gaming complex moving lower. The company says digital revenue was mostly in-line with consensus but other revenues, about 33% of the total, were far shy of estimates. The company was forced to lower guidance for bookings and adjusted profits. TakeTwo Interactive also reported a mixed quarter that missed expectations for many metrics. Both EA and TakeTwo were down more than -12.0% on the news and drug Activision down with them. 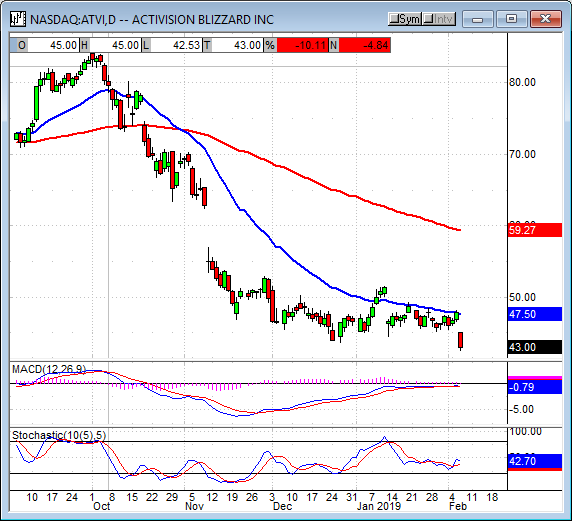 Activision moved lower by -10.0%, it reports earnings next week. 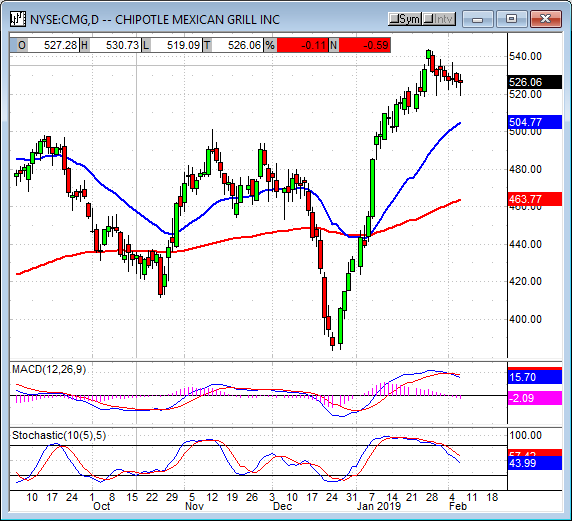 Chipotle Mexican Grill served up a sizzling top and bottom line earnings beat. The company says that revenue grew by 10.8% over the last year and adjusted EPS of $1.72 beats consensus by $0.32. Comp-store sales increased by 6.1% versus the expected 4.9% and were driven by the successful use of online sales/marketing. The company says digital revenue grew 66% over the same time last year and accounts for 12% of total revenue this quarter. Restaurant level margins improved as well, decreasing the overall labor cost to 27.1%. The outlook for 2019 is favorable, sans food-bourne illnesses, and helped drive shares up more than 10% in after-hours trading. 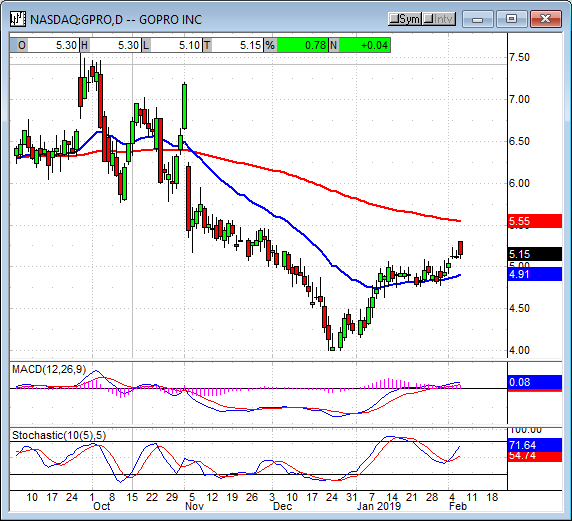 GoPro reported revenue grew 12.7%. The strength sales delivered a solid beat on GAAP and non-GAAP earnings. In the release, Nick Woodman says efficient execution, improved margins, and a strong product line-up helped drive results. Shares surged 11% in after-hours trading. iRobot reported earnings after the bell and swept past the estimates. The company, a consumer products/automation technology innovator, reports revenue grew nearly 18% over the last year and delivered EPS nearly double the expectations. Results were driven by strength in the US and International sales and, more importantly, show little impact of tariffs. The outlook for 2019 is for growth in the high teens, shares surged more than 17%. 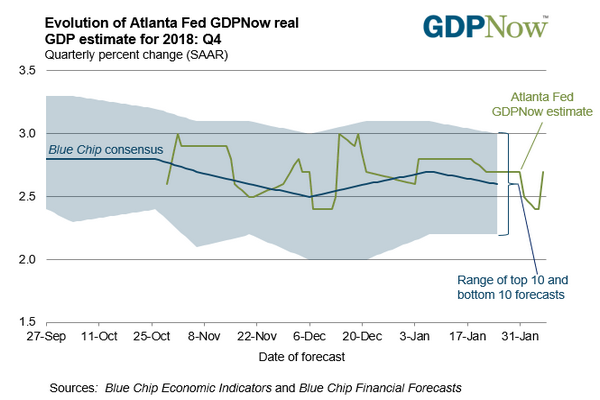 The index action was a bit weak despite growing trade optimism, not-as-bad-as-expected earnings, and a dovish Fed outlook. Today's moves were not large but they were largely negative and led by the NASDAQ Composite. 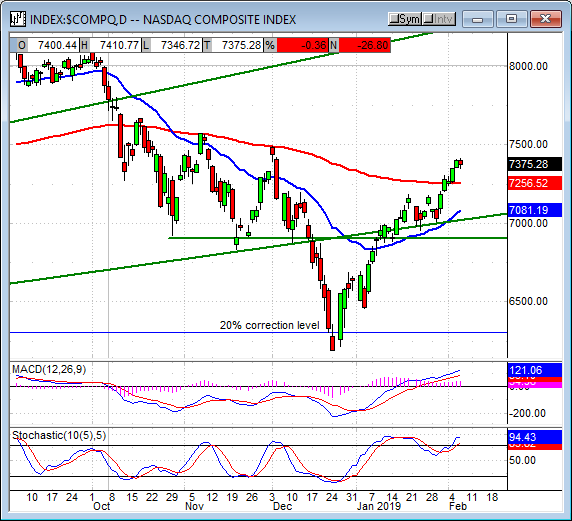 The NASDAQ Composite shed about -0.50% in the session to create a small red candle to the side of, and equal to, the previous day's upward movement. The candle, the candles, look like a small consolidation move, a little market slip, within the uptrend and the indicators so far agree. Both stochastic and MACD are bullish and suggest upward movement in the index is to be expected. If so, a move up to 7,500 is likely, a move higher possible. 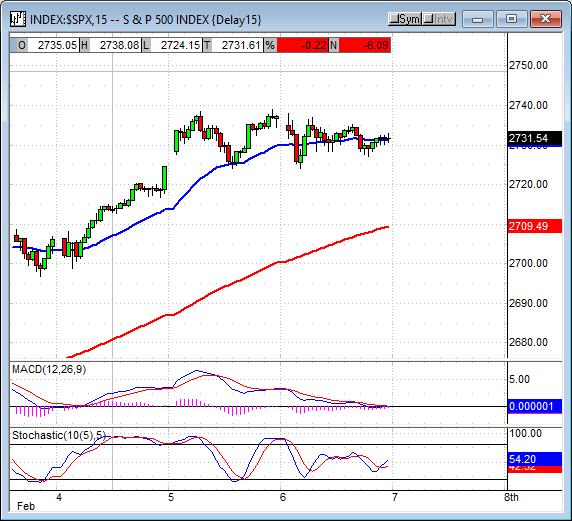 If the index slips further my first target for support is the long-term moving average. The S&P 500 closed with a loss near -0.30% after trading in a tight range all day. The index slipped from its fresh high but is still trending upward and may resume its rise over the next few trading days. The indicators are bullish and suggest a move higher is possible but there is a risk. 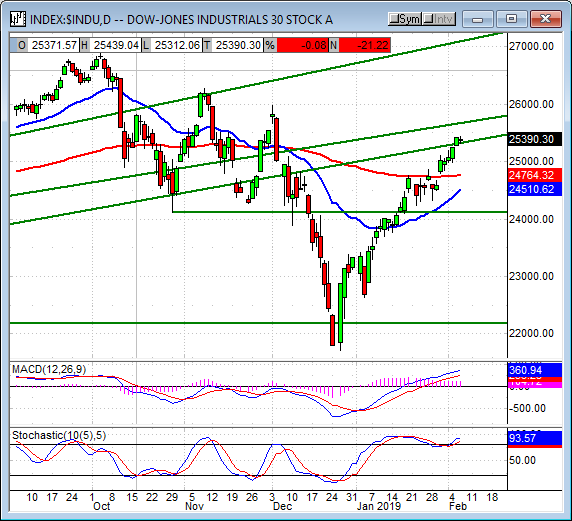 The indicators are also diverging from the fresh highs which suggest a weakening market. Upward movement is expected, just don't expect too much of it if it comes, my target for resistance is near 2,775. 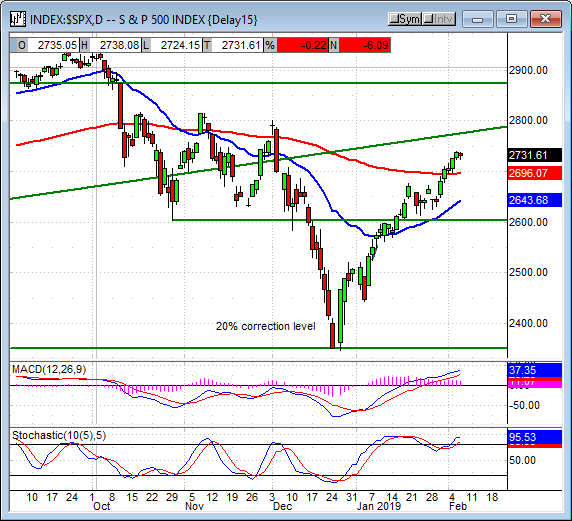 Support is near 2,700 should the index move lower. The Dow Jones Industrial Average posted a small loss, less than -0.10%, in a day of light trading. The index moved within a very tight range near the top of the previous candle and above a potential resistance target. This target is an uptrend line that has provided support/resistance numerous times in the past. The indicators are bullish and suggest a move up is possible, the caveat is that resistance exists near another uptrend line a few hundred points above today's close. 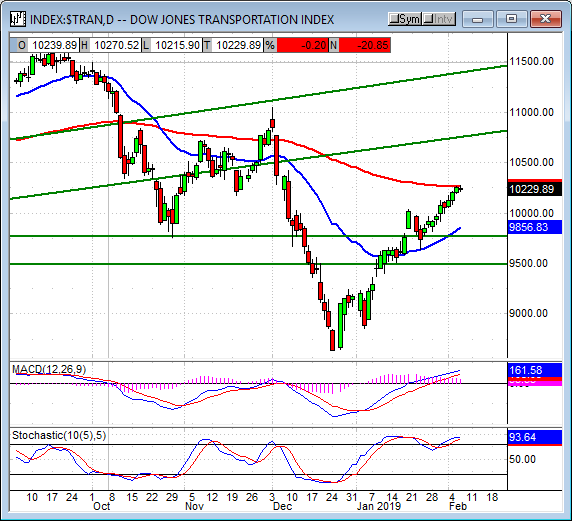 The Dow Jones Transportation Average also closed with a loss less than -0.10%. The transports created a tiny doji spinning top smack against the 150-day EMA where it may have reached a make-or-break moment. Momentum is waning so sell-side pressure at the 150-day EMA could stall the rally or cause reversal. A move above the EMA would be bullish, my targets would be 10,500 and 10,750, a fall from this level could be bearish but I'd wait a few days to see if a consolidation develops. 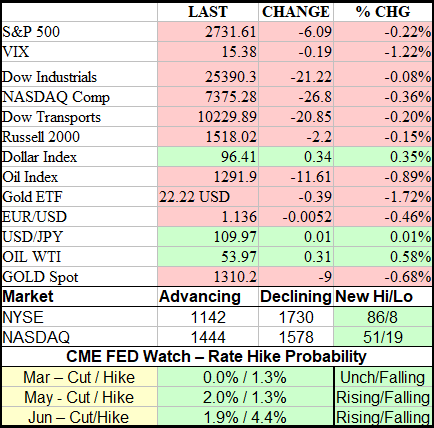 The market has been moving higher as FOMC, earnings, and trade-related headwinds subside. The lift provided by those factors is limited in that trade, arguably the single most important aspect of the equation is still in question. Janet Yellen says her dot plot today would should a wide range of possibility to the amount of risk in the market. She didn't say it outright but fixing trade with China means one outcome, an outcome with rising rates, and not fixing trade another, an outcome with declining rates and slackening economic growth. In either case, the outlook for growth is positive so I am firmly bullish because there is so much risk tied to the trade situation I am only cautiously bullish for the near term.